Size : 5.75 x 8.5 ins. This book has a total of 136 treasured selections, which are Bhajans and kirtans. A great number of the songs in this book were sung by many legendary playback singers from the Indian film industry. These beautiful selections were composed by numerous saints, sages and lyricists. The music for these divine selections was created by famous inspired musicians from the Indian film industry. These treasures were taken from our library of music; many tracks are still in 78 RPM Records. It is hoped that this humble presentation will meet your expectation. Laminated Covers with White Wire Spiral Binding. 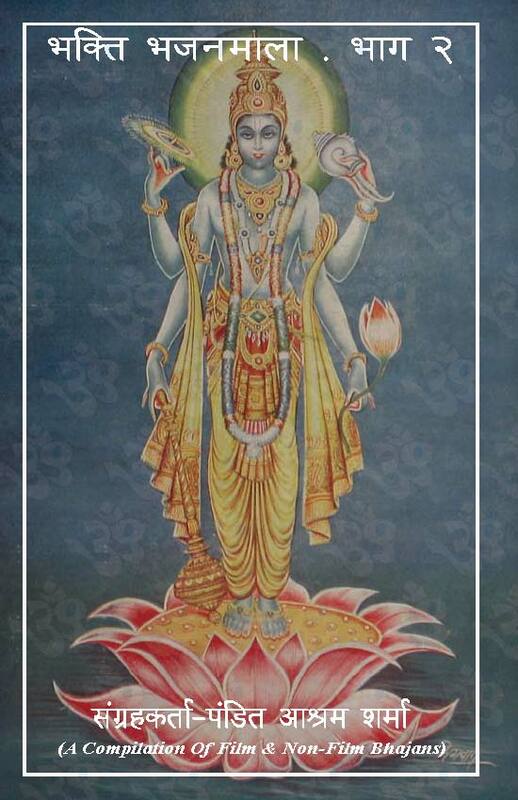 For inquiries on Bhakti Bhajan Mala Vol. 2 by Pt. Ashram Sharma in Trinidad and Tobago only please call (868-342-9951). In this Second Volume of Bhakti Bhajan Mala, I humbly present to you some other meaningful selections from my collection. Following your warm reception of Volume One, I have been encouraged to compile Volume Two. I tried tirelessly to maintain the original version of each Bhajan taken from the original tracks. I sincerely hope that you will enjoy this work to your heart’s content as this is specially dedicated to you. I tried to salute and give credit to the many Saints, Sages, Lyricists, Musicians and Singers who enriched and continue to provide spiritual and moral sustenance and expose us to the unfathomable treasury of culture and divinity which belongs to humanity at large. In Kali Yuga by simply chanting the name of God (Namasankirtan) with love and devotion one can cross the ocean of Sansara (mundane existence). Many of our Sacred Texts, Saints and Sages remind us of the importance of Namasankirtan. Let melody and harmony emanate from our hearts and let us take delight in the love that we express through singing aloud the glory of God. 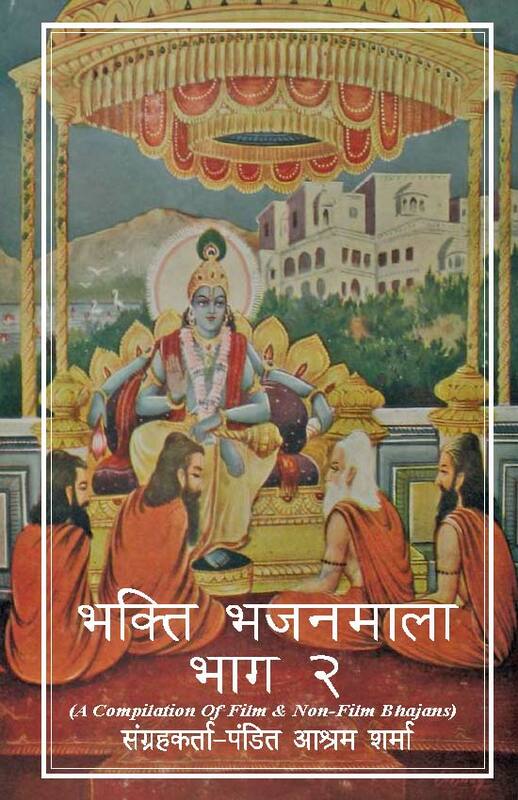 It is with great joy that I welcome and commend this inspiring collection of traditional bhajana and kirtana by Pandit Ashram Sharma. A bhajana is a song of love to God. Many of these compositions date back to the medieval period of Indian history that witnessed a great flowering of the devotional (bhakti) movement. In this collection one will find timeless compositions by saintly poets like Kabir, Surdas, Tulsidas and Mirabai. These songs are heard daily in Hindu homes and temples throughout the world. Most of the themes of these songs center around the avataras, Shri Rama and Shri Krishna. They describe the attributes of God and God’s compassionate activities. Many of these relate to God as the irresistible and attractive beloved and express an intense yearning for God’s vision (darsana). A kirtana, on the other hand, is a recitation of the various names of God, and several such names are combined and sung repeatedly. Whatever you do, whatever you eat, whatever you offer in sacrifice or give away in alms, whatever penance you perform, offer it to Me. Pandit Sharma’s collection of devotional songs is an expression of his own life-long bhakti. In addition, these songs are an excellent means (sadhana) for enabling us to grow towards the ideal of unceasing devotion (anapayani bhakti). While it is not possible to always be in a temple precinct or to perform traditional rituals of worship, these songs can be on our lips, heart and mind, helping us to center our daily lives in God. With the help of these songs, every act can become an offering to God. On behalf of everyone whose religious lives will be deepened and enriched by this labor of love, I offer gratitude (dhanyavaad) to Pandit Ashram Sharma. This book has a total of 136 treasured selections, carefully selected from our library of Hindi Songs. The Bhajans are in Hindi - Devnaagri Script. These Divine Books have been produced by Pandit Ashram Sharma involving a lot of hard work and dedication in the blessed land of Trinidad & Tobago. He has laboured assiduously to produce these immortal publications not only for the people of Trinidad & Tobago but for devotees of Sanathan Dharma all over the world. 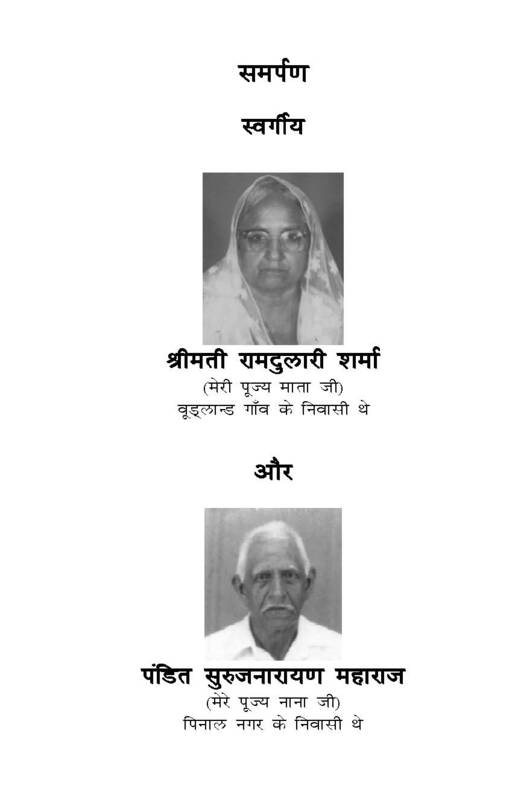 Together with his wife Sunita they have laboured incessantly to make these publications a reality. They show the righteous pathway to be taken by anyone to access the divine . I congratulate him sincerely and offer my best wishes for his success in this venture, and it is my hope that he will continue to make such contributions in the future. It is an exhilarating and joyful experience for me to have carefully perused the numerous bhajans compiled by my student Pandit Ashram Sharma. It is with a beaming sense of pride and conviction that I understand Pandit Ashram’s painstaking effort and meticulous interest he has taken to ensure the authenticity of the words in the production of this gem for posterity. This compilation of bhajans is a truly remarkable achievement with respect to the selections, the organization and the accuracy of the phoenetics. This sterling contribution to Hindu culture by Pandit Ashram Sharma will inevitably be remembered as a collectors item to be treasured for generations to come, I strongly recommend both volumes to every one. This collection of popular, traditional bhajans is appropriately selected for all occasions. It is my humble view that the approach and insightfulness of the compiler makes this book a prized possession for all. 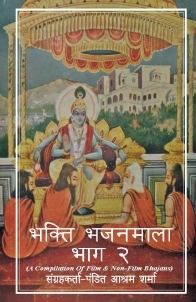 There are a multitude of published collections of Bhajans, many of which are excellent in their own right, however when it comes to selecting a bhajan book, “Bhakti Bhajan Mala” is always my favourite. Therefore, it gives me great pleasure to introduce and recommend this book to all. I have the great pleasure of owning and using Panditji’s books. We here in Houston Texas have made both volumes part of its Mandirs activities. The bhajans are well ordered and wording accurately done. Thanks for your wonderful work and may God bless you. I am fortunate to have the opportunity to provide both my thanks and my congratulations to Pandit Ashramji on using his skills, talent and dedication to establish this wonderful, ‘Sundar’ website and, more specifically, his books with phenomenal collection of bhajans and ‘Aartis’. As someone who has worked in the entertainment and broadcasting fields in India, Canada and the USA for over thirty-five years, I can truly appreciate the value of having a comprehensive reference for both an extensive bhajan collection, as well as more generally for Indian music and cinema. Pandit Ashramji has truly done a great service to the larger Indian community around the world by providing an accurate and accessible compilation to anyone seeking it. Again, my sincere thanks and congratulations to Panditji. I was very fortunate to come across Bhakti Bhajan Mala Vol.1 (English) and Vol. 2 (Hindi) at a Puja Store in Curepe. I was able to find Bhajans which I have been looking for a long time now. I found one which I used to hear from Pandit Deo Prasad and Pandit Parasram in the late 1940’s at the Mc Bean Kutia and I have been looking for this for years. I found several others by which I am greatly inspired. The Bhajans are listed in Alphabetical order so they are easy to find. The best part is the Bhajans are carefully researched and properly spelt and the correct words used. I do not sing a Bhajan unless I am sure of the correct words. I see hundreds of Bhajan Books but there are several mistakes. You can say or pronounce the Hindi word and get a different (bad) meaning. I therefore congratulate you and send my blessings for this great work. God will be with you always. I say my Pranaam and Dhanyavaad to Pandit Ashram Sharma. I have looked at and read carefully the Bhajans in Bhakti Bhajan Mala. This work is marvelous and complete. I congratulate Pandit Ashram for his hard work. Such a book should be in all homes. Mc Bean Couva, Trinidad W.I. It is to be noted that we remain indebted to Pandit Ashram for his consuming effort in his compilation and research that requires commitment and dedication to bring fruition and I can only acknowledge same and endorse the fact that to work hard and well at things worth doing is to know life’s greatest satisfaction. May the good Lord continue to give you the motivation to continue this noble venture.